WILMINGTON, DE - Nexium® (esomeprazole), the newest proton-pump inhibitor approved by the FDA for peptic ulcer disease, offers a unique advantage over the generic form of Prilosec (omeprazole), said a panel of industry experts this Wednesday. 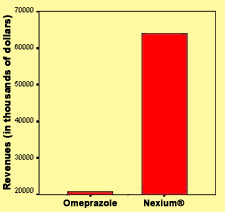 Namely, Nexium®, which is simply the L-isomer of omeprazole, is now the only proton-pump inhibitor definitively shown to enrich AstraZeneca, the pharmaceutical corporation that lost its U.S. patent for omeprazole in April 2001. Experts in the healthcare community attribute the unmatched ability of Nexium® to benefit AstraZeneca to a remarkable series of scientific discoveries made at the company's research centers during the mid-to-late 1990's. "First, they discovered that when they lost the patent for omeprazole, they wouldn't be making any money from it anymore, " says Dr. George Papadopolous, a pharmacist in Wilmington. "Then, they realized that omeprazole, like many chemical substances, has both an L- and an R- isomer, each of which is technically [winks] a different compound, according to FDA guidelines." "Finally, they tested and proved the hypothesis that the American public could be duped into paying far more for things available in less costly, but basically identical, formulations simply by employing colorful ad campaigns and effective direct-to-consumer marketing techniques," he concluded. Indeed, study after study since Nexium's release has indicated that Nexium® benefits the executives and shareholders of AstraZeneca signficantly more than do generic omeprazole or, for that matter, any of the other FDA-approved proton-pump inhibitors, with a p-value of <.005. "It's truly a miracle drug," said Patsy Goldberg, a long-time esophagitis sufferer. "Imagine that - a medication that helps my acid reflux about the same as as a cheaper generic would, and allows AstraZeneca to keep making money off me at the same time!" Researchers at AstraZeneca are currently hard at work "discovering" the R-isomer of omeprazole, with which they plan to overcharge the general public as soon as the patent for Nexium® runs out in 2014.